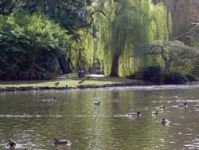 Located along the south shore of Victoria it has been a park belonging to the city of Victoria since 1882. Originally the First Nations called this area ï¿½Meeacanï¿½ (the Salish word for belly) because of its shape. It was then named Beacon Hill Park for the two beacons on Mount Beacon. The western beacon had a triangle (blue) and the other a square (green). These helped sailors navigate the treacherous waters. Now, in the heart of downtown Victoria it is the crowning jewel in Victoria's park system. An oasis of both natural and landscaped beauty, its unique features draw people time and time again.